The image above is of an Emperor's Royal Guard protomolded figure. 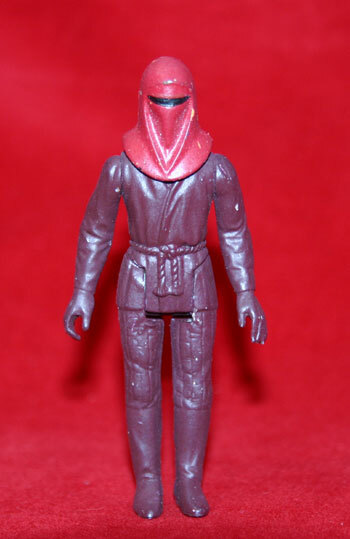 A protomolded figure such as this would have been made in-house at Kenner, as opposed to over seas as production figures and first shots were. The second image shows the head of the figure removed. 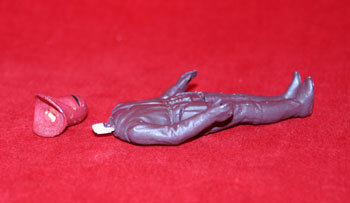 As with many of the Return of the Jedi era protomolded figures that is the only part that is removeable. The limbs are fully moveable but assembled in a way so as they cannot be removed as would be possible on a hardcopy. These figures were shot in a milky white plastic and then completely hand-painted. This can clearly be seen on the neck pin and inside of the helmet. Though it is not pictured this figure also lacks foot holes and copyright information since these would later be added to the steel molds over seas. By the time of Return of the Jedi protomolded figures had started to replace painted hardcopies as Toy Fair and photo samples. This figure was most likely used in one of those capacities.